First, I decided to add the color in Photoshop... Now, this looks pretty good, but the point of this project is not to make it pretty good. 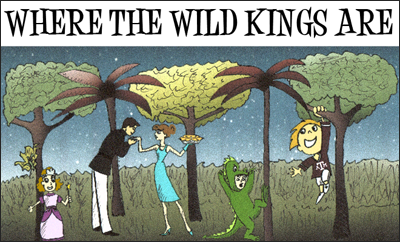 The project is to make the design look like the illustration work of Maurice Sendak. So, here is what I decided to do...I printed the image. Then, I did pen shading over the top. I knew on paper, that would look great, the unknown was "how will it look once I scaned it back onto my computer?" VERY cool - does the client LOVE it!! Fantastic. It is very creative work. I love it. Really, I mean that. I can't wait to hear about your playdate. You have SO much talent. I love what you did. Love. What a fabulous idea! I love that book and your pic is perfect! LOVE IT! OMG, you did an awesome job!!!! And where did you find the potential BFF? I've been looking for one of those, too! Really nicely done. Clever as hell. That looks amazing! You are awesome, seriously! This looks fabulous! Just fabulous! I'm sure you client was thrilled! That is just incredible! Kudos to you. Print a copy and let it accidentally fall out of your purse on your play date, hee hee. I'm diggin' this design! Girlie, you are talented! Awesome, awesome! And the idea.. pure genius!! Good luck with the new potential BFF! You did so well with this header! I knew you did good stuff, but wow! You captured the look/feel of the book exactly! That is awesome you are so talented! That is JUST amazing! I love it! You rock! GASP!!! That is GORGEOUS!! You should be so proud of yourself!! Love it, hon. I really do. That is freaking fabulous!!! Cyn, that is amazing. I think it might be your most amazing work to date. to have photoshop skills is the same to me as the ability to build a spaceship. you should be proud, very lovely and captured the feeling perfectly! holy cow girl! this is just plain amazing. you rocked it HARD! woo hoo! Wow - that looks flipping awesome! I love it. That is AWESOME! I love it. We read that book regularly in our house, and it is definitely awesome. oh my...that is a great design! i am so impressed!!!! oh and very excited for you to have a playdate with your potential new BFF. can't wait to hear about it!